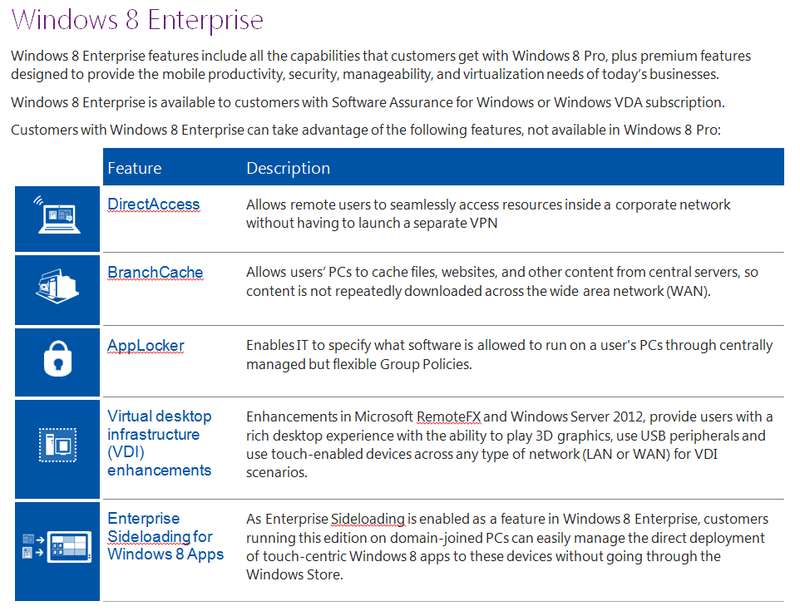 分別是:Windows 8 / Windows 8 Professional / Windows 8 RT 以及 Windows 8 Enterprise. 一般消費使用者透過彩盒包裝可以買到的版本有兩種: Windows 8 Professional & Windows 8 . Windows 8 Professional 就是如同現在的Windows 7 Professional 以及 Windows XP Professional. 而Windows 8則等同於Windwos 7 Home 版或Windows XP Home版. 這個版本適用於一般的家庭使用者,也因此這個版本將無法加入到公司的Active Directory網域中. 要特別注意的是由於Windows RT採用了ARM的處理器,所以將來可以在Windows 8/Windows 8 Pro等版本上可以執行的應用程式或App將無法直接適用於Windwos RT的平板上,反之亦然.